The photo and description are incorrect. The SA mark 9 bayonet does have a matching scabbard. The scabbard shown is for the bayonet for the FN rifle used by the SA Navy and later by the SA Police known in SA Defence Force terminology as the "M1". This has nothing to do with the USA terminology. 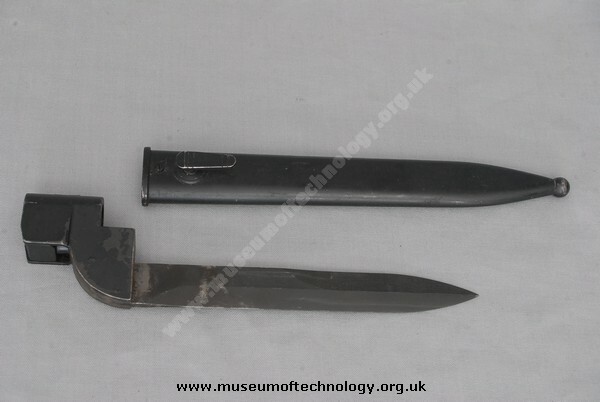 The SADF M1 has the plain barrel with no flash hider, the bayonet is a knife bayonet with two prongs on the muzzle-ring above the blade and is housed in a steel scabbard. The FN rifle used by the SA Army is the version with the flash-hider that also served as the grenade launcher and took the "apple-corer" tubular bayonet. The SA Mk 9 bayonet is housed in a synthetic scabbard with two variations of metal throat that was the correct length for the blade. This scabbard could also be used for the Bayonet for the Uzzi SMG (manufactured by FN) but the Uzzi bayonets were usually in a specific metal scabbard. Further details can be seen in the book on British Commonwealth Bayonets by Ian Skennerton where there are photos of my SA Mk 9 bayonet, alternately I will try to answer any further questions or provide photographs directly.